Multi-User, Multi-Platform, Matrix CATx KVM Switching System. 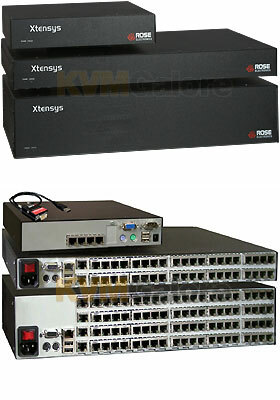 Xtensys CAT5 KVM switch features the latest in technology and can be deployed and scaled to any computer environment from the simplest to the most complex. You can connect either a miniature Rose KVM transmitter or a serial cable to the RJ45 computer input connectors on the unit. It auto-detects the interface. If video is present it will automatically measure the distance and equalize the video for maximum clarity. At the user side you connect a KVM user station to access any computer. The built in OSD and hot-key system allows you to select a computer using simple keyboard commands or from a sortable list and switch to it instantly. The single-port user station connects a single KVM station to a single KVM port on an Xtensys switch. For the ultimate in connection flexibility, the 4-port user station permits a single KVM station to connect to a KVM port on four different Xtensys switches, four standalone servers/computers, or a combination of Xtensys switches and standalone computers/servers.